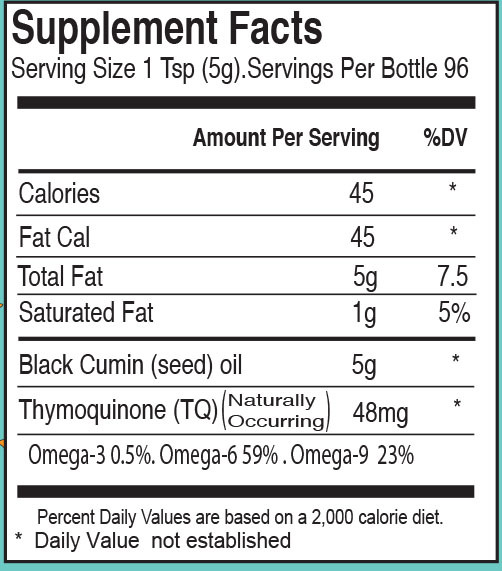 Pure Cold Pressed Black Seed Oil 16 oz. Pure Nigella Sativa is Loaded with Vitamins and valuable source of EFA's 3/6/9's and also contains two very powerful phytochemicals Nigellone and Thymoquinone along with other nutrients that work synergistically to support the body's various functions. For adults, take one (1) teaspoonful (5ml) twice daily, preferably with a meal. Can be used in oatmeal, mixed with yogurt, cottage cheese, salad dressings, blended beverages and protein drinks. As a reminder discuss the supplements and medicines you take with your health care providers. Free of: yeast, wheat, milk or milk derivates, lactose, sugar, preservatives, soy, artificial flavor, sodium (less than 5mg preserving). You never know who or what Allah(swt)is going to put in you life. This flax seed oil is one of the best oil's yet. I had chronic constipation and was given 2 weeks to live and that was on April 2,2008. Without taking laxatives I would die,because I couldn't go to the bathroom from 7 to 10 days. with that it cause me not to eat at times because I was so full because I couldn't go to the bathroom,oh how hard did I fight that. Do you know the pain that is associated with constipation. It was catch 22 with me. I have cancer of the nose, mouth, ears, lungs, and liver, plus the bad pain that comes with it. Thanks to Allah(swt) and sweet sunnah for the flax seed oil for these extra days that I'm living. Keep up the goodness for Allah(swt), and his slaves, Insha-allh. Ja-zak-allah. I felt an energy difference in one day, after feeling tired for several months. There there not too much taste of the oil, therefore it make it more pleasant to consume. The black seed oil has really helped with my eczema. I have been rubbing it in to my arms about a week and I've noticed the changes already. I plan on purchasing this product again insha'Allah. My energy level has shot up significantly. I combine using this with the flax seed oil. The taste is difficult for me, therefore I have ordered the capsules. If you can tolerate the aftertaste, it is great. I will trying using the remaining oil for skin care.